Hi, I'm Juliet and its an honour to be visiting from Tartankiwi. 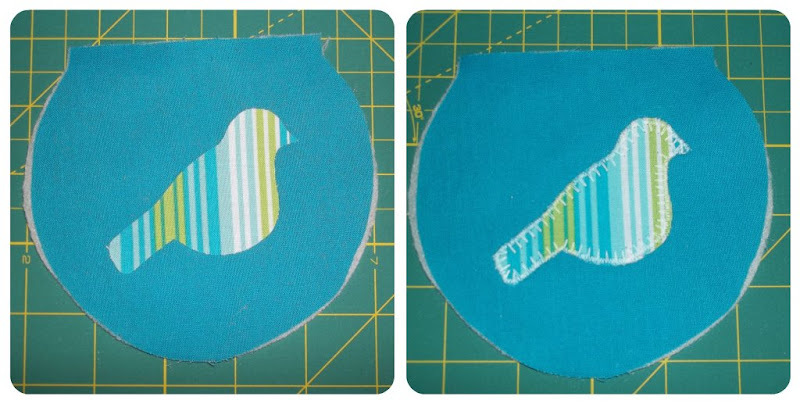 Firstly can I say a huge thank you to Nin, for inviting me to share this tutorial on her blog. I'm fairly new to writing sewing tutorials, so if anything is unclear please do not hesitate to ask. Several people have asked me where I bought my flex frames. These came from an Etsy store. Just search for flex frames in the "supplies" section and you will find lots of stores that sell them. This tutorial is for the basic purse, I have not included instructions on how to appliqué the bird outline, but I have included the template with the pattern if you wish to use it. Unless otherwise stated, all seams in this tutorial are 1/4 inch. *Note: These dimensions leave a very snug channel for the flex frame. If you prefer more wiggle room, you can make the short side of the rectangle 2.5 inch instead of 2 inch. I used quilting cotton, if you are going to use bulkier fabrics, I suggest you increase the width of the flex frame sleeve. For the body of the purse you will need. Start by cutting all your fabric. Take the small rectangles which will form the sleeve for the flex frame. Fuse the fleece to the lining fabric. Place the inner and outer fabrics right sides together. Sew along one of the short ends. Ensure that all the short ends are lined up and sew the other end. Turn it right side out. Press. You should notice that the seams lie nicely hidden on the inner side. Repeat for the other leg of the flex frame cover. Now take the fusible fleece and the outer fabric for the body of the purse. Press to fuse them together. If you want to appliqué a design onto the purse, this is when I do it. Fold the sleeve for the flex frame lengthways and centre on the straight edge of the body against the right side of the outer fabric. There should be 1/4 inch on either side of the sleeve. Try to be as exact as you can at this stage and work as precisely as you can, it is really worth the effort! Using a 1/8 seam allowance, sew the flex frame sleeve to the body of the purse. Lay your lining fabric right side down on top of the flex frame sleeve and the outer fabric (which is right side up). Sew along this edge. Repeat these steps for the back of your purse. Flip your purse open and you should see the completed flex frame sleeve. At this stage, check that you can wiggle the flex frame into its sleeve. It will be tight, but it should fit! If it doesn't fit, now is your chance to unpick! Once you're sure that everything fits, remove the flex frame. Open the fabric up and lay the front and back piece right sides together. Line up the edges and pin. Sew around the edges starting at the bottom of the lining piece. Be careful that you sew next to the flex frame sleeve and do not sew it into the edge seams. Also make sure that you remember to leave a gap at the bottom of the lining. Carefully notch the curved edges ensuring that you don't cut through your seams. Turn the purse the right way out. Insert the pin in the flex frame. Give it a final press and then stand back and admire your handiwork! These are such fun to make and once you get the hang of it, you can have lots of make all sorts of variations. Here are a couple of other ones that I have made! Wow! I have never even heard of those flex frames before, and now I really want to make one! Great tutorial juliet, ! Gorgeous idea!Thanks for sharing tutorial! Thank you! I made one and the tutorial was spot on! I posted a pic on my google. Now I can make the eyeglass case to match! Great! I made one and it turned out perfect! I'm ready to make more. Thank you for your hard work of an easy to follow tutorial! Have you tried 'grading' the seams - cutting a wedge off the seam along the top of the bag (that attaches the channel to the main body of the bag) at a 45 degree angle will reduce the bulk. Also, if you have a needle position dial on your sewing machine you could try moving it to the extreme left. Hope that is a help. Thank you so much for this tutorial <3 . I have sewn those tiny pouches for animal welfare auctions but without a lining and I've racked my brains how to sew a neat lining into them. You've helped me (and thus the animals) a lot).